All four issues of the year 2015 in English language for a special price! Tatjana Bösl designed a Quad helmet for the world’s sprinting champion Usain Bolt. A size of 28 mm is big enough for Angel Giraldez to paint realistic and detailed miniatures. Marcus Eisenhuth turned the German soccer fairy tail into a memorial. Jan Peeters tells the secret of strictly designed landscape painting. Round 2 with Roger Hassler’s Texture Effects. “Airbrushtutor“ Mitch Lowther shows how to master volume, form and texture of lips. Holger "Candyman" Schmidt tells you everything about the glossy finish. The portrait of Morgan Freeman, painted by John Florez, combines various styles and materials. Bernhard Laschober designs a Trojan style Harley with copper foil and a portrait of Achilles. Steve Driscoll shows how to paint a color portrait from a black and white photo. This artwork is a prototype of Jürek’s amazing airbrush and paint brush mixed technique. White skulls and flags on a black truck – that’s classic automotive painting by Steve Gibson’s. Roger Hassler shows how to create a fake metal look with an airbrush and a paintbrush. Canadian Martin Bouchard goes about his designs with a good bit of sensitivity, fantasy, and professionalism. Alluring: Argentinian Diego Baubinas designs the Strawberry tongue on a T-Shirt. This is not just for David Bowie followers: Ariel Castellaro shows an amazing black and white portrait with a „color spot“. Lies Maria Wilhelm traces the way of the Samurai and is decorating a motor bike helmet with cherry blossoms, characters and warriors. German Sarah Richter imagines a hellride to beyond with the ferryman Charon. Roger Hassler show simple masking techniques to render water drops for different designs. Very productive: Dutchmen Rob van Dijk renders two new artworks per month – just as a hobby! Finnish artist Ari Huttunen de Carvalho renders an impressive number of folds. 825 hours of work: Jeroen van Neijhof is definitely a perfectionist and passionate about details. Jaroslaw Bytow needs nothing but one color plus a bunch of erasing and scratching tools for his wet beauty. Ugliness meets perfect free handing in Chad Mahone’s scary clown portrait. Texture stencils and spray make for the final touch. More than just air: Roger Hassler meets the challenge to painting clouds. 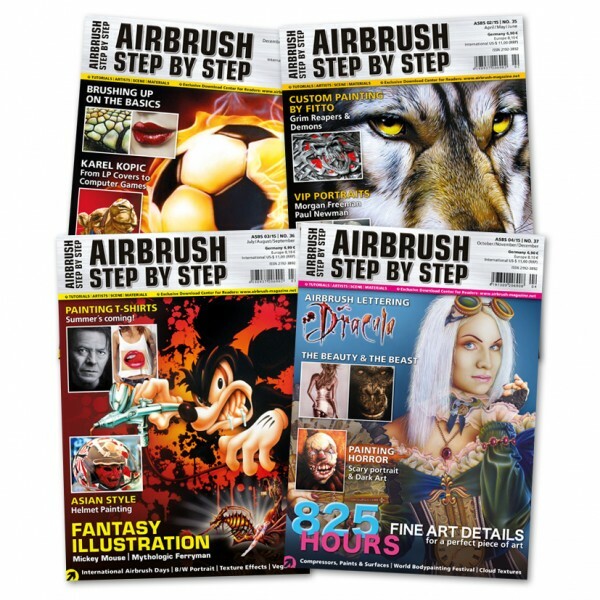 Related links to "Airbrush Step by Step annual set 2015 (4 issues)"
Customer evaluation for "Airbrush Step by Step annual set 2015 (4 issues)"